In practically all industries ERIKS is the leading company for different kind of orings and rubber parts. 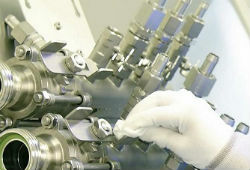 Besides manufacture all different orings, ERIKS has also the possibility for an oring test. They test the orings to make sure they can guarantee the highest quality. ERIKS can also do an oring test for clients with specific requirements. Why do I need an oring test? An oring test can help you map out where certain risks are. Due to the conditions the oring will be used, we can test a specific oring to make sure he fits all requirements. An oring test is therefore commonly used in a lot of industries. What do we uses for an oring test? For an oring test we use a basler inspection machine on surface defects. This machine brings out the tolerance and imperfections on the surface with a camera system in a certain condition. To test other elements we also use a laser controlled system for overall changes and a measurement System for changes in the shape. For more information about the oring test please download the technical handbook. Questions about the oring test? For more information about our oring test, please fill out our "ASK ERIKS" form on the right and we will help you with all your questions. We can personalise the oring test so it fits the requirements of the oring in a specific situation. With this we can make sure your can determine all risks and purchase the oring suitable for the job.